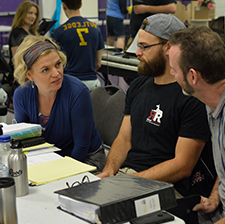 This paid program pairs an emerging Apprentice stage manager, designer, props maker, wig maker, electrician, and carpenter with lead hands in each show in the season with an emphasis on elements of technical design and production. Artists-in-Residence for our current (2015) season are: Sean McMullen (Set Design) and Katherine Johnston (Lighting Design). Requirements: Resident Artists must have been actively pursuing a professional career in theatre for the past seven years and have a minimum of three design credits. 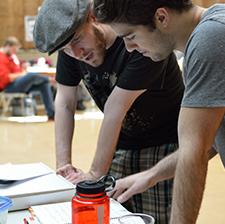 Production Apprentices are typically engaged for the duration of the creative process on the show to which they are assigned (Winter 2014 – Summer 2015). The time commitment varies depending on the nature of the apprenticeship. For some the time commitment is very light in the earlier stages of the process – less than an hour per week. However during rehearsals (May – July) it is expected that all Apprentices be in attendance at all rehearsals, meetings and public appearances as assigned by the theatre. Requirements: You must have been actively pursuing a professional career in theatre for the past five years and have a minimum of one creative team credit as an assistant (Lighting Design, Set Design, Costume Design, Hair/Wig Design, Stage Management, Carpenter, Electrician). Having an education in theatre, or equivalent experience at the community or professional level is essential to the program.